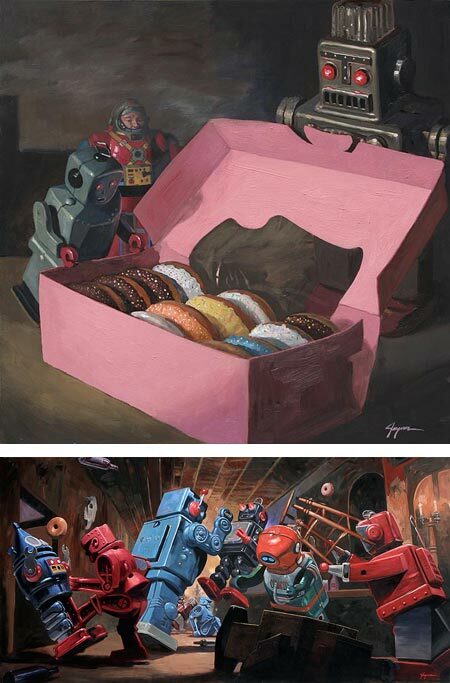 Eric Joyner has a seemingly endless fascination with robots; not just any robots, mind you, specifically those wonderfully bizarre tin robots from the 1950’s, largely made in Japan and often constructed in inexplicable configurations; oh, and doughnuts, lots of doughnuts. Joyner was an illustrator with clients like Random House, McGraw-Hill, Levi’s, Sprint, Hasbro Warner Brothers and Microsoft; and had received awards from the Society of Illustrators and Spectrum art collections. He began to enter juried shows with his own paintings of urban landscapes, Mexican masks, cartoon characters and… tin robots. The latter captured his attention and as his presence as a gallery artist grew and he transitioned into gallery art full time, he focused largely on that theme; oh, and doughnuts, lots of doughnuts. Joyner’s site has galleries of his work, arranged by year, in which you can find numerous examples of his favorite subjects, which also include plastic robots, particularly the Rock ‘Em, Sock ‘Em Robots, and a few movie an TV robots, like Robbie the Robot from Forbidden Planet (my personal favorite) and the Robot from Lost in Space (who I found out actually had a name: “B-9”, as in “benign”); oh, and doughnuts, lots of doughnuts. When browsing the galleries, be sure to click on the images to see the larger versions. His work is much more painterly than you might assume, and large in scale. 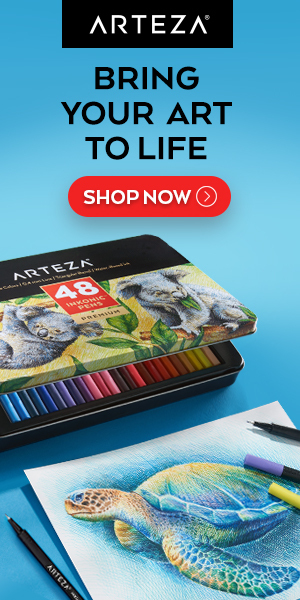 He doesn’t give the dimensions in on the site, but you can see some of his pieces in this video interview on Art Babble. You can also find a few more images of his work on his blog, Ruminations from a Tin World, though it’s only a few posts. There is a book of Joyner’s work, titled, as you might expect, Robots and Doughnuts. As you go back in years through his blog, you’ll find other somewhat related subjects, like tin spaceships, hot rod models (driven by tin robots, naturally), tin cars and other collectibles; oh,… and doughnuts, with and without sprinkles. Robots and donuts are some combination. Who would have thought. Hello. Happened upon your blog and very happy that I did. Thanks I really enjoyed the paintings.